Q. What is a detox footspa? It is an electronic system along with the conductivity of water enhanced by salt, creates a controlled electromagnetic field. This field changes polarity in a programmed way and in return promote the stimulation of cells and nervous centers that reject the accumulation of toxins, bringing back the natural balance and will leave the individual with a overall feeling of wellbeing. Q. Why through the feet? In each foot there are, approximately, 2.000 pores and therefore it is the ideal point of application. The feet are the end of blood and lymphatic circulation and are above all the first to suffer from problems in circulation and trouble elsewhere in the body. Due to the beneficial effects of the combination Water / Air / Magnetic Fields, the hydro-massage has also several indications for health and beauty. Q. What is the relation between feet and the Organism? Feet reflect every organ and gland of our organism. Massage by electromagnetic impulses activates the healing mechanism that exists inside of each one of us; its effects are cumulative, this is, at each new session the feeling of physical and emotional well-being is reinforced. Once the areas that reflect our organs are stimulated, an anxiety relieve is immediately felt, resulting in a major physical strength, helping the body recovering from muscular wearing. Q. What are the benefits, directly and indirectly, in several situations? 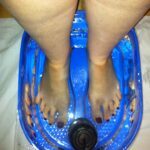 For people who suffer from heavy and swollen legs, to make a detox foot spa treatment is a unique sensation of relieve and well-being. Besides, it functions as an organism defense, neutralizing the infectious agents and producing antibodies. Hidrolinfa makes the lymphatic and the circulatory systems flowing more efficiently, it also makes the bio-energetic balance of the organism helping removing liquids in excess and preventing the duplication of adipose cells. The well-being provided through this therapy is beneficial and helps fighting any kind of disease, once it establishes better communication between organs and the defence system of the organism. Q. What are the contra-indications?